Documentation could be retrieved from sparks.discreet.com / Solutions / "How To Extract Thumbnail Images". Anyone able to write something? At a first glance it does not look like a big deal to do it... But where can I download 3dsmax SDK, API description and some sample max files (of different version) without registration? Could someone please provide these information? Thumbnail view is not yet implemented. Autodesk® 3ds Max® Preview plugin 1.0.1.0 launched! 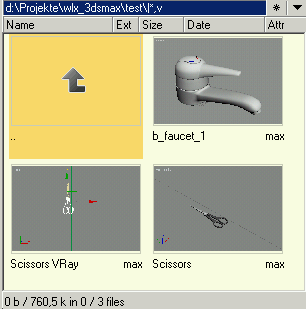 tbeu wrote: Autodesk® 3ds Max® Preview plugin 1.0.1.0 launched! great job! does exactly what I want! thanks! tbeu wrote: At a first glance it does not look like a big deal to do it... But where can I download 3dsmax SDK, API description and some sample max files (of different version) without registration? Could someone please provide these information? No, of course this is not the latest SDK! The latest can only be get as a sparks member or when you buy 3dsmax. Autodesk® 3ds Max® Preview plugin 1.0.3.1 launched! Autodesk® 3ds Max® Preview plugin 1.0.4.0 launched! Actually, there is no direct need to install the Autodesk 3ds Max Preview plugin as I just figured out how to do extract the preview thumbnail of 3ds Max files using XnView. I believe XnView version must be less than 1.80 and the plugin Xcompound.dll must be available for XnView. Restart TC and you can see the preview thumbnail in lister, Quick View or Thumbnail View. Max2012, 2013: version# are not shown for these max versions this is maybe due to the Unicode change..
BobGo wrote: Max2012, 2013: version# are not shown for these max versions this is maybe due to the Unicode change.. Sorry! Should be fixed in 1.3.0.1. There is nothing for which you have to excuse!!! *I* have to excuse for bothering you!! btw: if you have access to maxsdk, there's a dir \samples\utilities\maxfind\ which demonstrates how all the other file properties could also be read out. It would be more than cool, if those could also be displayed somehow. But I doubt that you're allowed to publish the source code then..